Britain's Jack Laugher won a second bronze at the opening World Series event of the year in Tokyo. The 24-year-old, finished third in the men's 3m springboard event behind Chinese pair Xie Siyi and Cao Yuan. Xie and Cao sealed the top two places with scores of 548.80 and 529.40 respectively, with Laugher's 469.25 enough to put him third. Laugher and partner Dan Goodfellow took men's synchronised 3m springboard bronze on Friday. The pair have teamed up with Laugher's regular partner Chris Mears, who he won Olympic gold with in Rio, taking a year out. 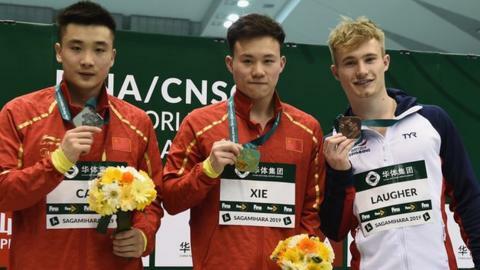 "I was really happy with the synchro with Dan - to come out at our first international and get a medal was really good," said Leeds-based diver Laugher. "Individually, the first three dives were great but the last three not so much, but it's a learning curve. The nationals [last month] weren't so good, so I wasn't the normal confident Jack and I was a little bit more nervous. "I've got Beijing next week and hopefully I'll use what I've learnt here to move forward and do better. The goal will be to try and improve on those last three dives." World Series debutant Ross Haslam failed to make it through to the final while Lois Toulson missed out on a place in the women's 10m platform but finished sixth with Matty Lee in the mixed 10m synchro. Inspired to get into diving? Find out how to get into diving with our special guide.